Bail Bonds New York City: Is Bail Tax Deductible? Unfortunately, there may come a time in your life when a loved one needs you to pay their bail money. It makes sense then to wonder if it’s possible to deduct what’s paid out in bail on your annual income tax return. Keep reading to learn more from ABC Bail Bonds in New York City. Let’s first dive into the bail process. If a jailed individual doesn’t have enough money to pay the full amount of bail on their own, then he or she must work with a bail bond company. The majority of bail bonds services will require the jailed or their family to pay an initial chunk on the full amount and then they will pay the rest. For example, the judge sets a person’s bail at $1,000. The bail bondsman, meanwhile, asks them to pay 10 percent ($100) to the company. To get the person out of jail as quickly as possible, the bail bond agent pays the full $1,000 to the court. As long as the jailed individual shows up for their court appearances, the court will give the company a full refund ($900 plus your $100). Note that the individual on trial will not get a refund of the $100 they paid to the bail bonds service. Now we can move forward with answering the original question: Is bail tax deductible? While bail is technically money paid to a government entity, it isn’t considered a “tax” at all. Consider bail money as a type of fine and a guarantee that the accused will show up for his or her assigned court date. 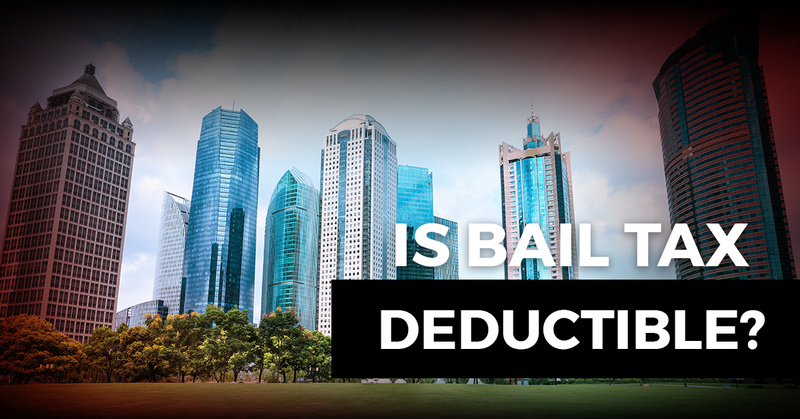 Though the bailiff may use the term “bail tax,” it will not be deductible. ABC Bail Bonds Agency is proud to be a third generation business with over 50 years of experience. Licensed and thoroughly trained, we make it a point to come up with a speedy solution for folks trapped in a difficult situation. You can feel comfortable knowing that our staff is here to give you the best and most up to date information regarding your loved one. We don’t just strive to expedite the bond posting process, though. At ABC Bail Bonds, you can count on us to treat your matter with the utmost discretion and confidentiality. If you’ve ever dealt with a bondsman, you know how frustrating the transaction can be. Unfortunately, many local companies barely give their customers the time of day. Please know that we don’t conduct our business that way. We fully understand that those who call us have little to no prior experience with a bail bonds company. At ABC, we treat our customers like people, not as if you’re just another number. You can feel at ease knowing that our agents are creative and flexible. There’s no “cookie-cutter” approach when handling customers. We will work with you and go the extra mile so that your loved one gets out of jail as quickly as possible. For your convenience, ABC accepts all major credit cards and checks. Call us today for 24/7 assistance.